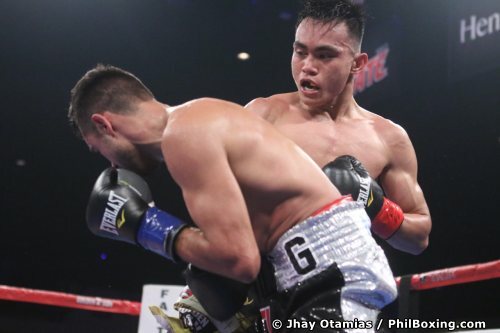 Young Filipino slugger Romero Duno of Tagum, Davao del Norte stopped local favorite and house fighter Christian "Chimpa" Gonzales of Buena Park, California in the 2nd round at the Belasco Theater in Los Angeles Friday night. Duno, 21, of General Santos' Sanman Boxing, dropped Gonzales, 21, of Golden Boy Promotions, twice in the fight - once in the first and then the deciding punch at the 57 second mark of Round 2. 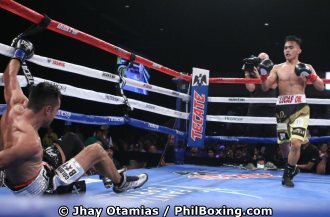 The young Pinoy who was jumped on and pummeled early in the fight by Gonzales, sent his opponent down with a well-placed right hand to the chin in the final minute of the opening round. Gonzales got up, but was visibly surprised and shaken from the knockdown. He survived the Filipino's attempt to put him down for good in the dying seconds of the 1st and was immediately tended by his team after the round. 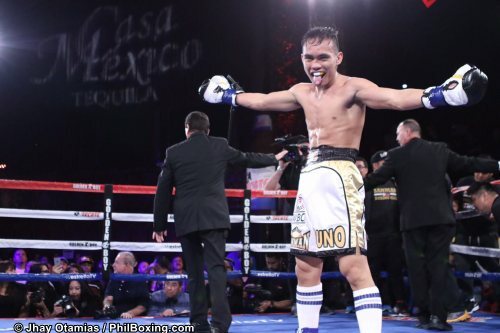 Romero Duno celebrates after stopping Christian Gonzales in the 2nd round. Gonzales is being helped by the referee after he was knocked out by Duno. Team Duno celebrates, L-R: former world champion and trainer Rodel Mayol, Duno and cutman Dr Ed de la Vega. Duno now 13-1 with 12 KOs, started aggressively in the 2nd. He again unleashed another right hand that toppled the previously unbeaten Gonzales (16-1, 14 KOS) down in the early moments of Round 2. Gonzales again got up to his feet after that big blow but he was dazed and was wobbly on his feet prompting Referee Thomas Taylor to halt the fight in favor of a KO win for the young Pinoy fighter. Duno wins the vacant WBC Youth Intercontinental lightweight title with the upset win while Gonzales suffers his first defeat as a professional. The bout was shown in the United States by Golden Boy Promotions and Tecate as part of their 'Boxeo Estelar' show over Estrella TV Friday night. You can reach the author at rrmaze24@yahoo.com and @Freemazon910 on Twitter.